Legend has it that St Rule was shipwrecked near the Culdee settlement of Kilrymont on the Fife coast. He had with him the relics of St Andrew who had been crucified in Greece. 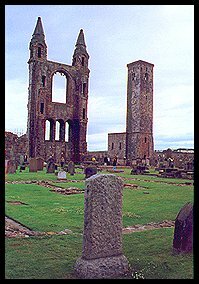 St Rule founded a Christian Church at Kilrymont and eventually the settlement adopted the name of the church, St Andrews. The cathedral was founded in 1161 and the nearby St Rules Church was built around 1130. The top of the church tower can be reached by a spiral staircase and it affords a superb view over the town.